The Stallion, like most of us, loves flavorful, filling food. Typically that involves using a lot of butter, cream, cheese, fatty meat, starch, and other things that aren't great for the waistline. 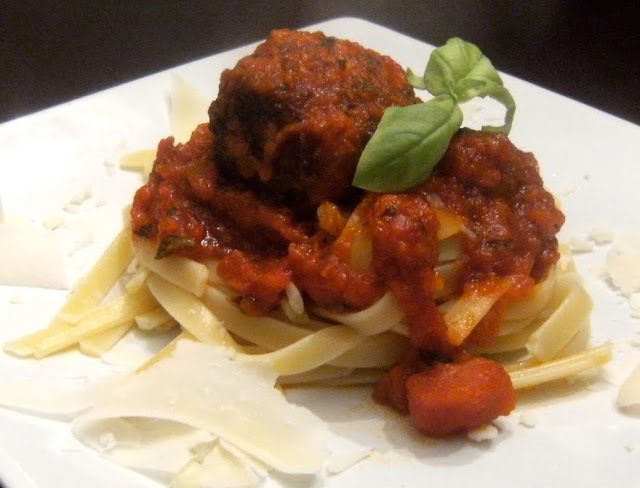 But these meatballs are an exception! They are virtually fat free and oh so yummy. The Italian Stallion says so. Speaking of which, the other night we turned on the TV and it was on the food network. The 'how things are made show' was on, touring a factory where they make jalapeno poppers that are sold in super markets. Today, that happened! I can't believe I accomplished a lifetime goal so quickly! We were riding back with the Stallion's mother (Mama-San) from touring a potential KC reception venue. We were talking about what we were going to do with the rest of our day. The Stallion told Mama-San that I had to make meatballs. (Which I did, because I didn't freeze the meat when I brought it back from the grocery store... a week ago) I told her I make turkey meatballs, and she got very excited because she was in need of a recipe to make use of some ground turkey. And then it happened. So, here's the recipe - it's so easy. These balls are amazing and totally guilt-free. A perfect winter meal that satisfies your need for warm, comforting food while falling easily within the bounds of a sensible diet. You'll need wheat bread, ground turkey, milk, scallions, Italian flat-leaf parsley, garlic, an egg, and salt & pepper. Start by placing about 2 1/2 slices of bread in a food processor - great time to use the heels if no one in your household eats them. We eat Nature's Pride 12 Grain. It is really tasty bread. ...Aaaannnd the Stallion designed their website. But that only influenced the trial - it really is really good. The 12 Grain is my favorite in the NP lineup. Turn it on, and let 'er rip. Keep going until you've got some fine bread crumbs going on. Move to a small bowl, add a quarter cup of milk, and stir it all around with a fork to distribute. Let it sit for a few minutes while you chop up the flavor makers. The flavor makers in this recipe are the scallions, parsley and garlic. They transform the bland turkey to something way yummy. Chop up about 5 scallions. And 4 cloves of garlic. And what will wind up being about 2T of finely chopped parsley. Everything goes into one bowl - the turkey, breadcrumb mixture, flavor makers, 1 egg, and salt (1 1/2 t) & pepper (1/2 t). Fold with a spoon to combine thoroughly. Typically it's easier to do this with your hands, but my hands were way too cold! And sear on all sides - it will only take about 30 seconds per side, so you'll be tending them pretty much constantly. Until they're browned on all sides. There is major flavor makin' going on here. Once they're all browned, add in the sauce. I just use jarred pasta sauce. Shake the pan to get the meatballs coated in sauce, cover and let simmer for at least 30 minutes. This will not only finish cooking the balls, but the flavors will really develop. You may need to add a bit of water throughout the cooking process to keep the sauce the desired consistency. I added about 1/3 c. to this pan after simmering for a while. I'm only cooking for me and the Stallion, so I don't use anywhere near the whole batch of balls. To freeze them, line up the balls on a parchment-lined baking sheet. Stick 'em in the freezer for an hour or so, then the balls will be hard enough to place into a ziploc or airtight container. Serve over pasta with parmesan and basil, or in a roll for a meatball grinder. The Stallion really loves his balls in a grinder. And they're fat-free turkey! Place bread in food processor and process until fine crumbs form. Transfer to a small bowl, add the milk and stir to distribute. Let sit for 5 minutes. Chop the scallions, garlic and parsley. In a large bowl, add the turkey, breadcrumb mixture, scallions, garlic, parsley, egg, salt and pepper. Gently fold all ingredients until thoroughly combined, or use your hands. Add 2T olive oil to a saucepan over medium-high heat. Add the meatballs and turn until browned on all sides. Cover with pasta sauce and simmer, covered, for about 30 minutes to finish cooking the meatballs and allow the flavors to develop. You may need to add water to keep the sauce the desired consistency. Place the meatballs on a parchment-lined baking sheet and freeze for an hour or so, until the meatballs are firm and can be transferred to a ziploc bag or airtight container.